Happy Friday! Today I'm continuing with my love affair with blue and white stripes. 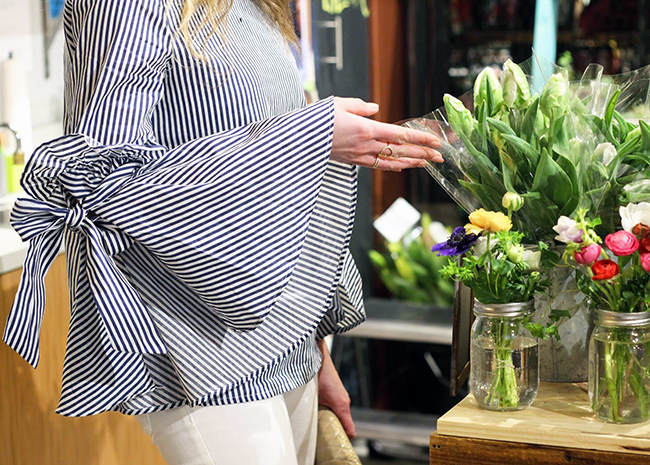 I've mentioned before that this pattern is one of my must haves this spring (here and here), and this stripe bell sleeve top is proof why. 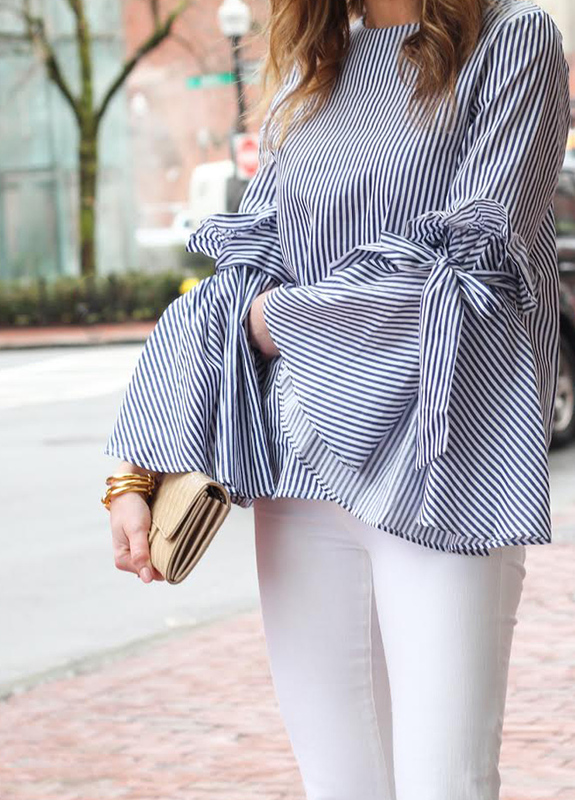 I love the classic feel of the stripes, while the bell sleeves add a fun, and dramatic, twist. 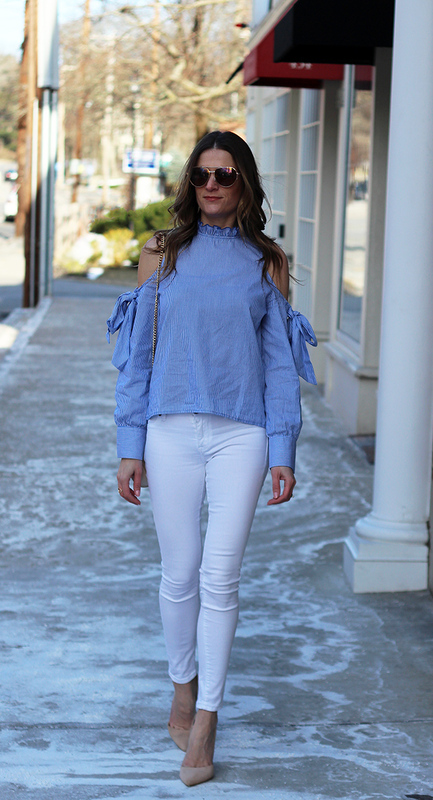 Because this top is the perfect statement piece, I kept the rest of my look simple by pairing it with white flare jeans, and blush pumps. It's funny that I'm sharing such a spring look today, when in reality I'm in Killington Vt in the middle of a snow storm. We were expecting to hit the mountains this weekend for a little spring skiing, when in fact we are being hit with a winter storm. Hopefully we'll get some fresh powder to ski on, with hopes that it will be full on spring when we return home! The feature blogger is Sarah from Trendy & Tidy. How beautiful does she look in this choker style dress? Make sure to visit her blog and say hello! Another weekend gone, another Monday upon us. Although I usually have trouble getting my Monday's started (thank goodness for coffee), I do love the fresh start to the new week, and the feeling that I can conquer anything. Because I'm a little sluggish on Monday's I only want to wear comfortable clothes, however, I still want to look put together. To get the best of both worlds I reach for my black joggers. I love jogger pants because they can easily transform from weekend style to work wear. Pair them with a white tee and a pair of trainers, and you have a cute weekend look. Switch out your tee for a blouse, your sneakers for heels, add a little jacket, and you're ready for the office, and to take on the week. Today's outfit is my second look styled from LIT boutique, here in Boston. On Friday I shared this beautiful blush dress, and why LIT has become one of my go-to shopping destinations. Make sure to check out the post, here, and if you don't live in the Boston area, you can shop their website and Instagram. *This post contains affiliate links. All thoughts and opinions are my own. Thank your for supporting the brands that I love here on Threads for Thomas. Happy Friday my friends. 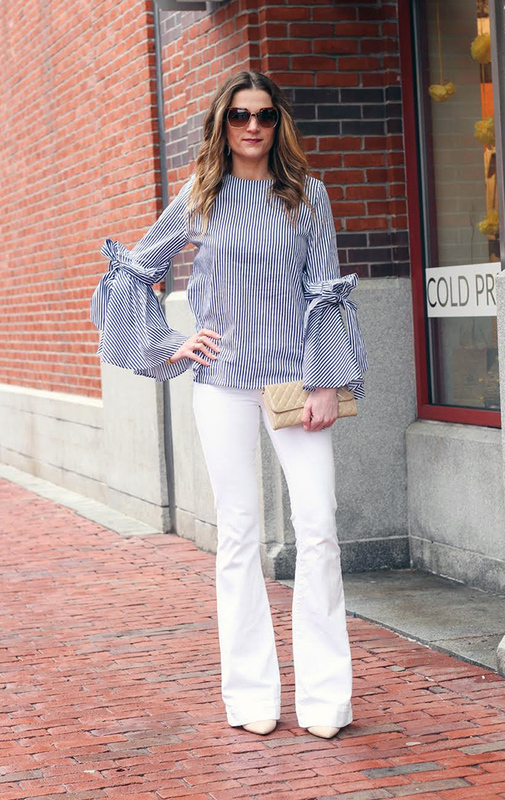 I'm excited for today's post, not only because I am OBSESSED with this dress, but because I get to share with you one of my favorite boutiques in the Boston area. 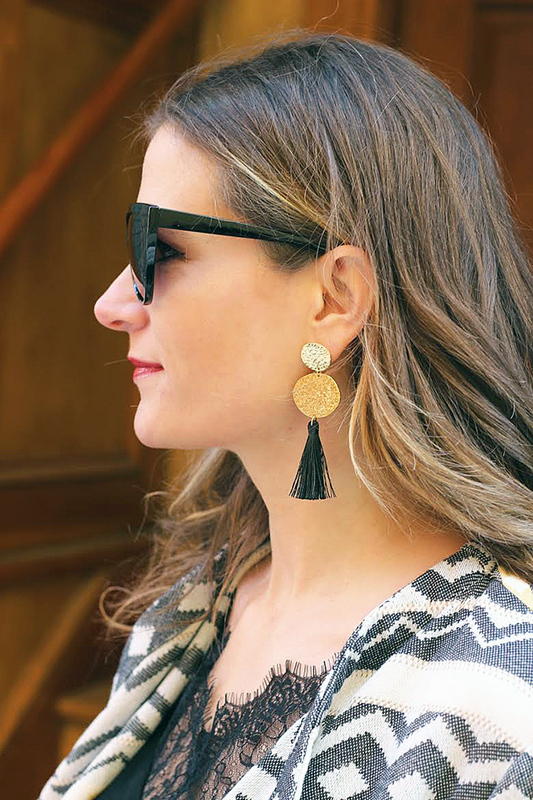 LIT Boutique, located on Newbury Street and in the North End, is a store I only recently discovered, but has quickly become one of my go-to shopping destinations. Not only do they carry some of the best brands (Blank NYC, Keepsake, DL1961, Lovers + Friends, and Quay to name a few) but it is a one stop shopping destination. Whether you're looking for a cocktail dress, the perfect sunglasses, a new pair of jeans, or the seasons must have shoes, LIT is bound to have it. I fell in love with this blush dress the second I laid eyes on it. It's the perfect dress for all the upcoming spring and summer events, and I love that it can be easily dressed up for a wedding, or worn for a girls night out on the town. We all know that I'm in obsessed with the color, but what really caught my eye was the cut of the dress. It's just so different from anything that I own. To give it a more conservative feel, and add a little warmth while it's still cold, we finished the look with a black cropped jacket. The lace details and fringe hem add the perfect compliment to the dress. If you live in the Boston area, make sure to stop by LIT, and for those of you who are not in the area, don't worry. 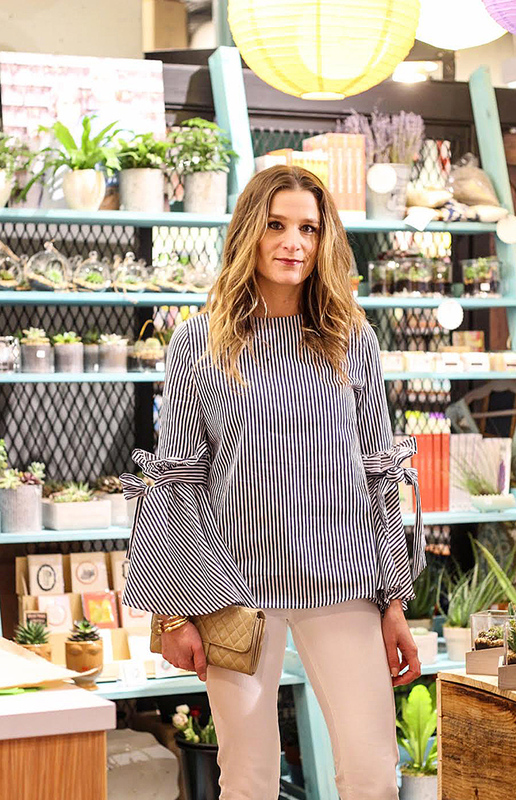 LIT also has a location in Portsmouth, NH, plus you can shop on their website and Instagram. The feature blogger is Brooke from Pumps and Pushups. 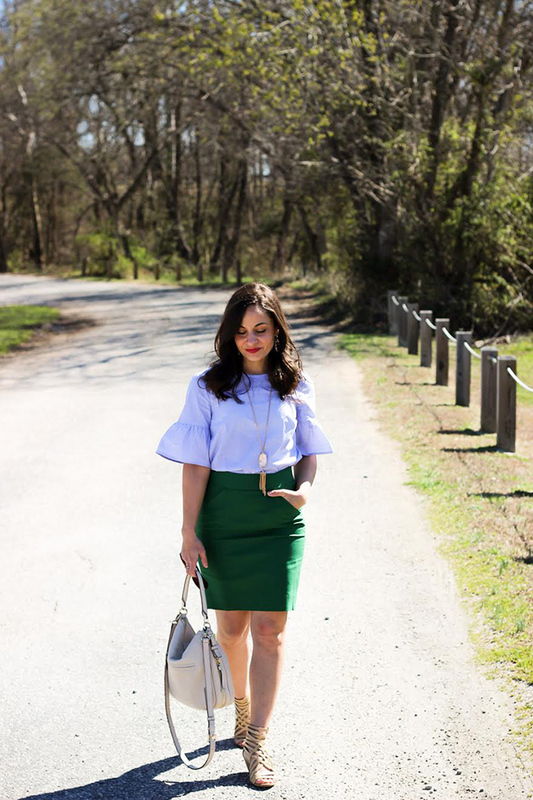 I'm loving her green skirt and bell sleeve blouse. Not only does she have great style, but I love her fitness tips. Make sure to visit her blog and say hello! Happy spring everyone! Although, it doesn't feel much like spring here today in New England because it's freezing! Hopefully we'll get our warm weather soon. One of the reasons that I love the spring so much (besides the warm weather, longer days, and my birthday), is that it always makes me feel like I can have a fresh start. Maybe it's all the new blooms, or seeing the green grass again, but I like hit my reset button this time of year. One of my favorite ways to start fresh is by revamping my wardrobe, and of course, updating my denim collection always comes first. 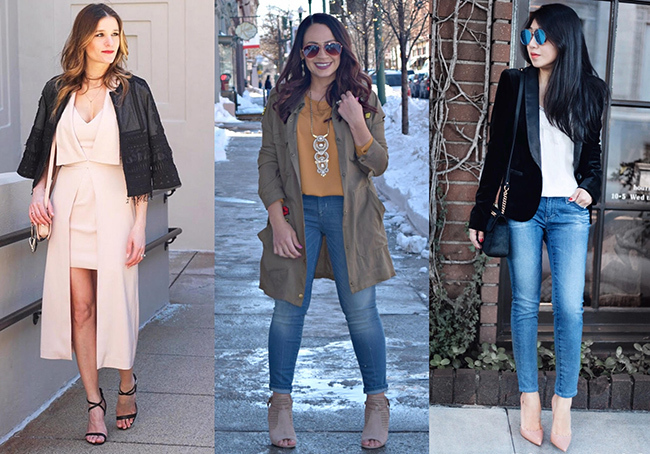 I've rounded up all the denim currently on my radar in this must have spring denim guide. 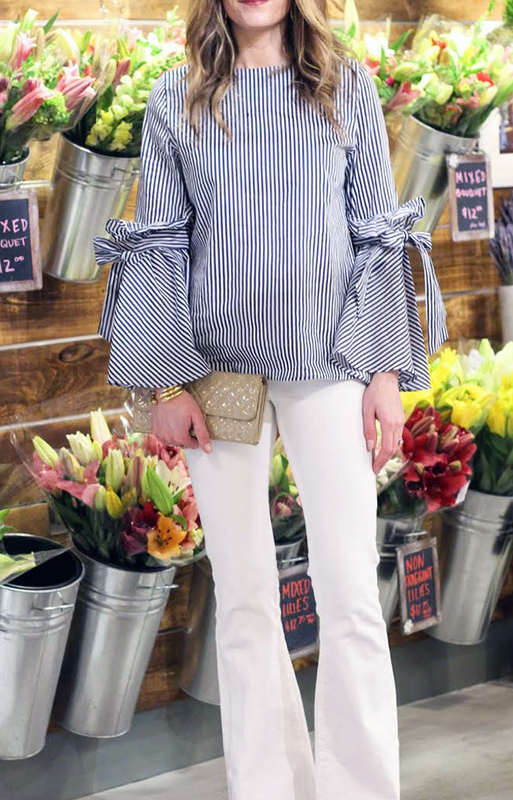 I'm sharing the top spring denim trends, along with my picks for each. 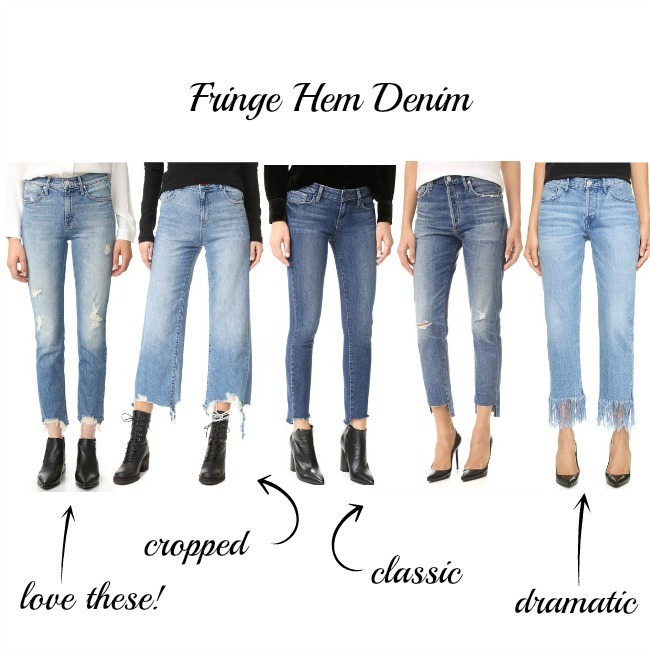 My favorite trend this season is fringe or frayed hem jeans. 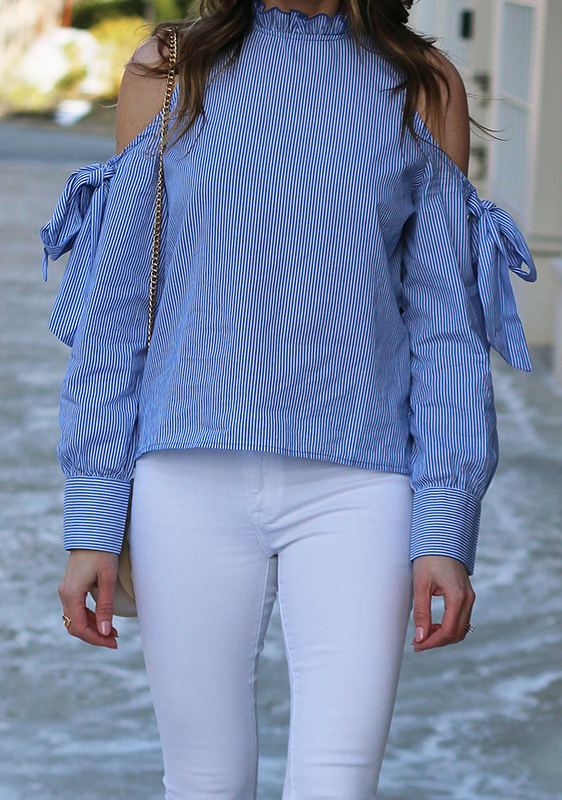 It's a great way to easily update your denim, and I love the bit of edge the undone hem adds to your look. 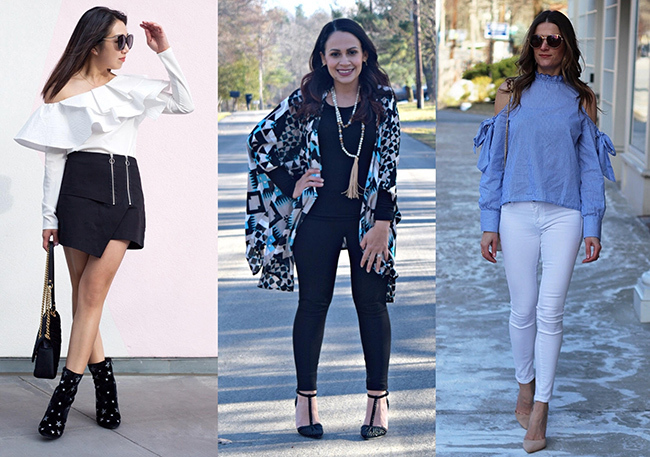 Whether you go for a subtle frayed hem, or a dramatic bottom, this trend is one everyone should have in their closet. 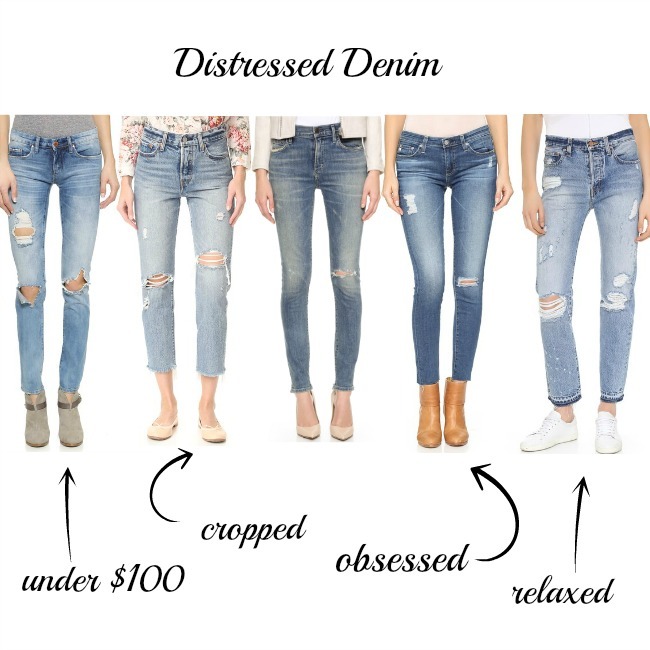 Distressed denim is currently my favorite thing to wear, and I'm glad the trend isn't going anywhere. 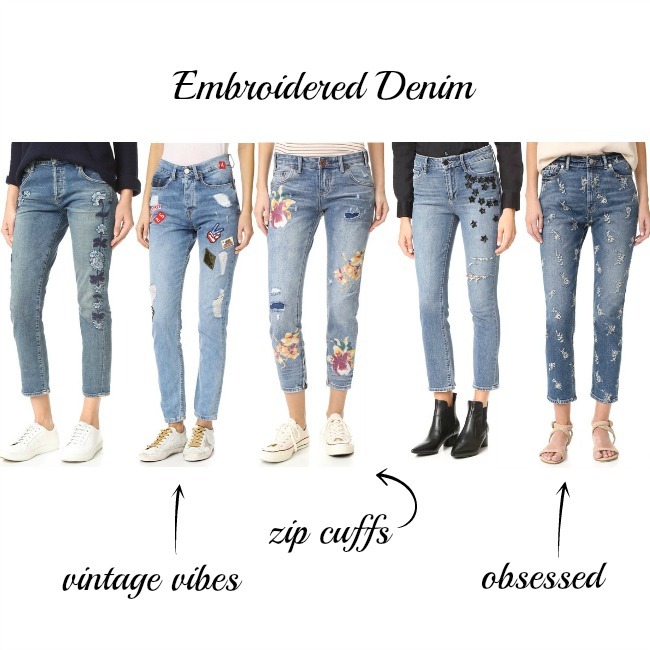 I especially love wearing ripped jeans in the spring and summer because they give off a relaxed feel, which summer is all about, plus they add a little ventilation on those warmer days. These AG ankle jeans have been my favorite pair for several years now, but you can't go wrong with this pair by Blank Denim, especially if you're looking for a pair under $100. I'm in love with this cropped pair, and thinking they will be my next purchase. If you don't like your jeans to be too distressed, then these Citizens of Humanity jeans make a great option. A big trend this spring is embroidery, and I am especially loving it on all things denim. Embroidered jeans are a fun, and playful, way to update your look. Plus they make great statement pieces. I'm loving the florals on this cropped pair, but this Paige Denim pair is probably my favorite. I love that the embroidery is subtle, and will go with everything. It wouldn't be spring if I didn't have a pair of white jeans in my closet. 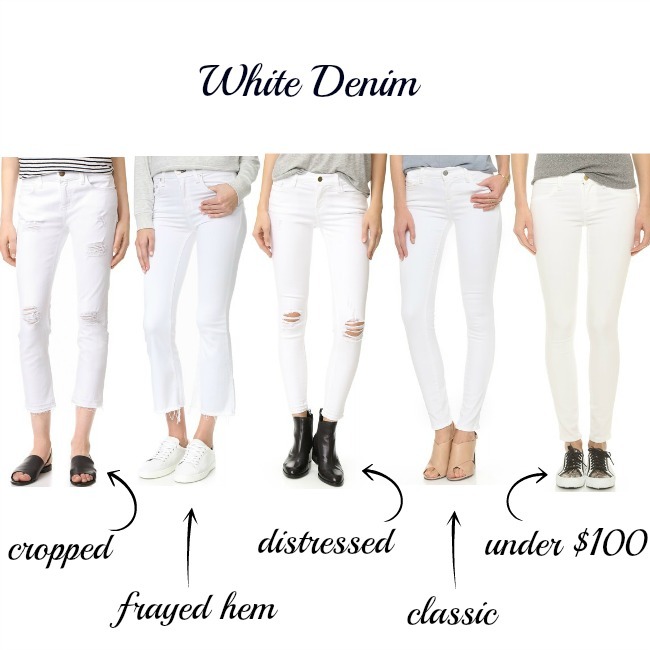 I love how most white pairs have a dressier feel than blue denim, and can really lighten up your look. 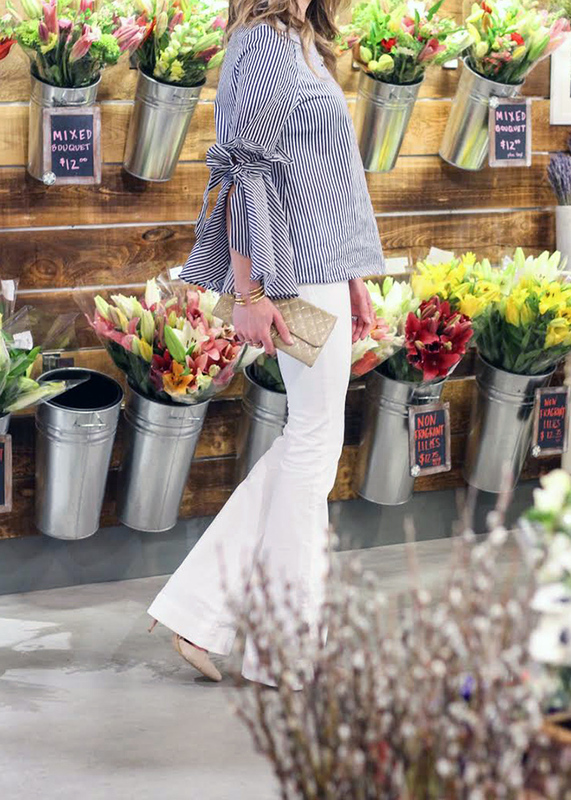 I think that every woman should have a clean and classic pair of white jeans in her wardrobe, and I've always been a fan of J Brand and AG for such. Also, if you've been reading this blog for a while, you know that this Blank Denim pair is my go-to, plus I love that they are under $100. For a more relaxed feel, look for a cropped pair, or one with distressing. With summer soon arriving, I love having a good pair of denim shorts in my closet. Being a mom to two toddlers, I try finding pairs that aren't too short, so I can easily wear the to the park. For that, knee length or boyfriend shorts make great options. Although, I am a fan of shorter jean shorts, so my trick to wearing them in your 30's is to size up. The looser fit makes them a tad longer and more age appropriate. 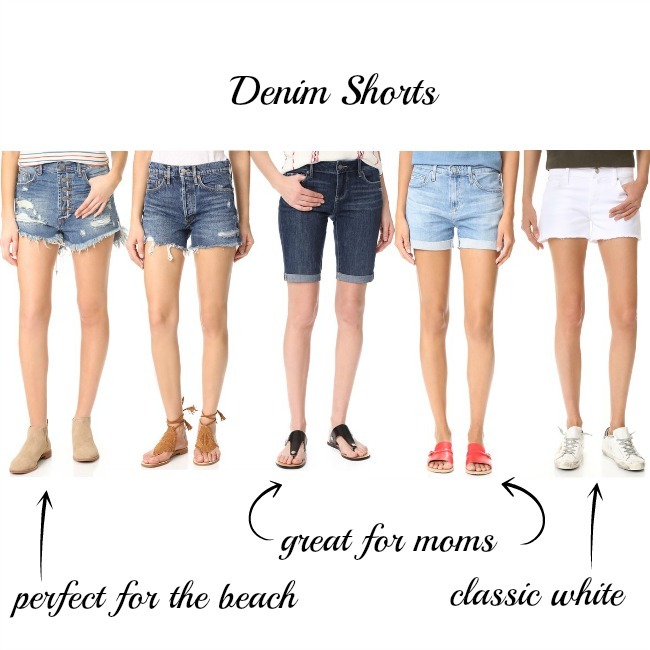 I also love the look of distressed jean shorts, which are perfect to wear to the lake or the beach. 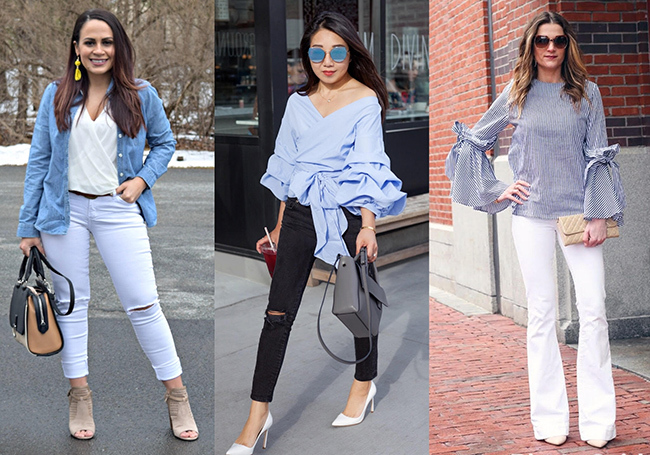 What's your favorite denim trend this spring? *This post contains sponsored content. All thoughts and opinions are my own. Thank your for supporting the brands that I love here on Threads for Thomas. 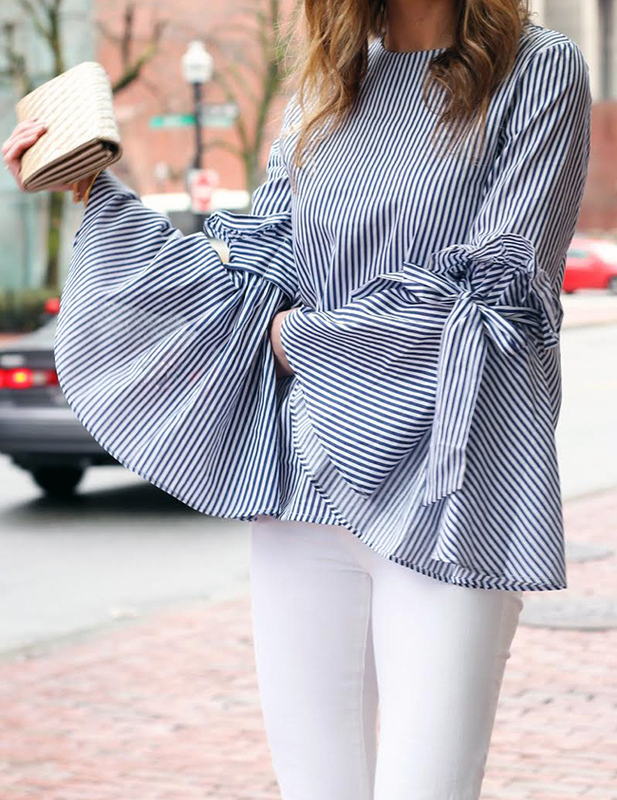 Well, to say that I have an obsession with blue and white stripe tops would be an understatement. 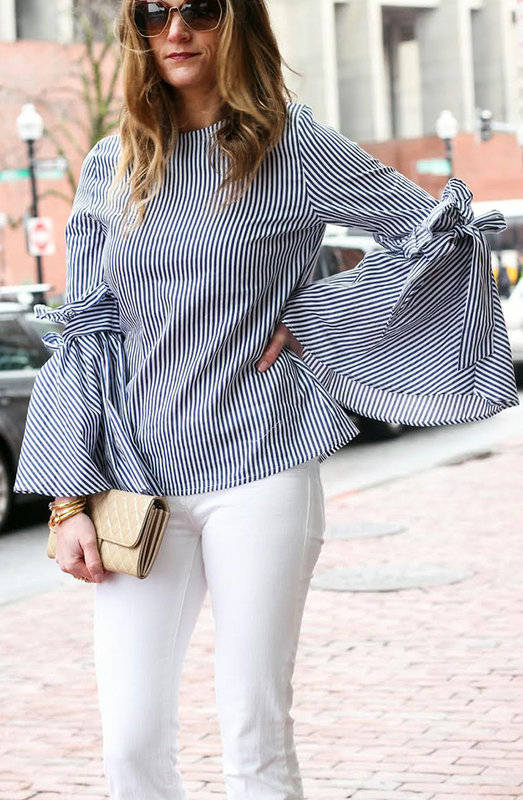 Last week I posted about my love for stripe tops, and how they should be a staple in every woman's spring wardrobe here. Since then I have added two more blue and white stripe tops, a stripe dress, and a stripe pair of wedged espadrilles to my closet. I actually didn't realize how much I ordered of the print until everything arrived on my doorstep this past week. Oops. The good news is that of all the pieces are unique, and I can't wait to style them for spring. 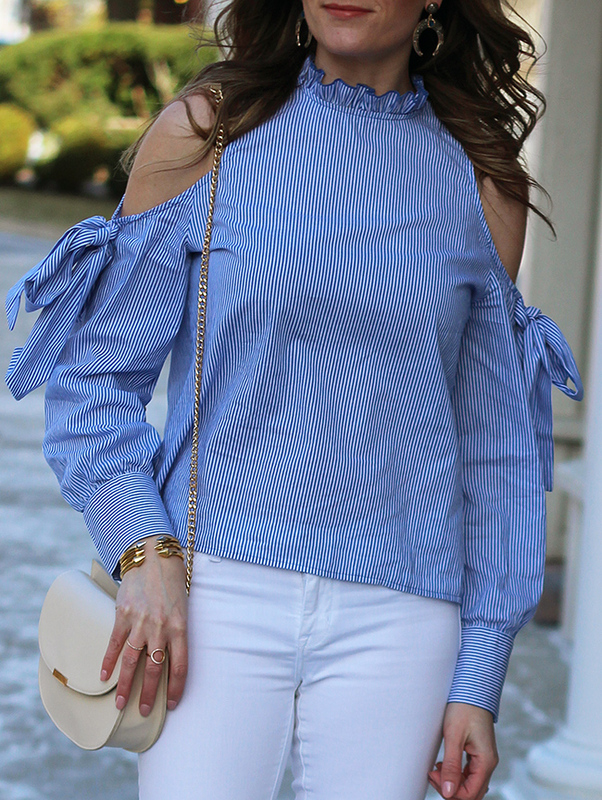 This off the shoulder tie sleeve blouse is another goody from SheIn. I love how the ruffled neckline and bow details gives it a feminine feel, while the open shoulders add a bit of edge. I decided to go for a spring look by pairing it with my white skinny jeans, then added my blush pumps and blush faux leather for a little warmth. 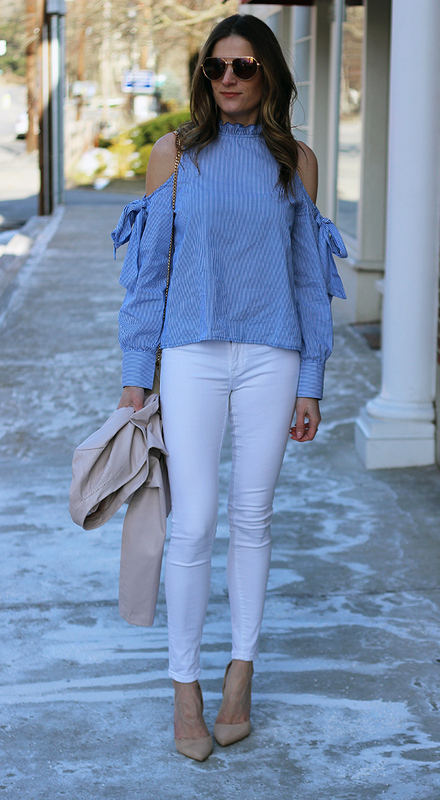 I love how this outfit is so fresh and spring looking, but is warm enough to wear while we get through the last of these winter days. Just add a parka if you're going outside! The feature blogger is Adriele from Style Assisted. I'm absolutely in love with this look! Is her striped dress not the cutest? Make sure to visit her blog and say hello!